One winter wedding, two happy couples, three ex-boyfriends. And a very uncomfortable weekend. Carol hates Christmas. Being recently dumped, she’s not crazy about weddings either. So her sister Marley’s nuptials, over the Christmas weekend, are making her positively Scrooge-like. When she arrives at the stately home in rural Scotland to find her three ex-boyfriends in attendance, Carol has no choice but to face her ghosts to discover what really happened in those relationships, learning a lot about herself in the process. As the snow falls outside and the fire crackles in the hearth, might one of the wedding guests become the harbinger of Christmases to come? 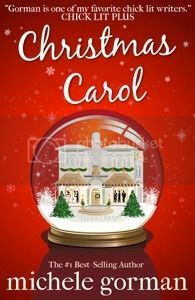 This wickedly funny re-imagining of Dickens’ A Christmas Carol will warm the cockles of even the coldest heart. What a great updated version . I really much enjoyed it. It was a quick read and it would be perfect to read on one of those days you feel the winter blues. This book is very well written and I just couldn't stop reading it. Good thing it wasn't a long book because I would have stayed up all night reading it.